The Anthony Weiner search warrant has just been released, and it details the type of info authorities were gunning to get ... and the warrant mentions Hillary Clinton by name. Weiner is under investigation for allegedly sending sexual texts to a 15-year-old girl. According to the warrant, law enforcement wanted to go through Weiner's laptop to see if there was classified Hillary Clinton correspondence. 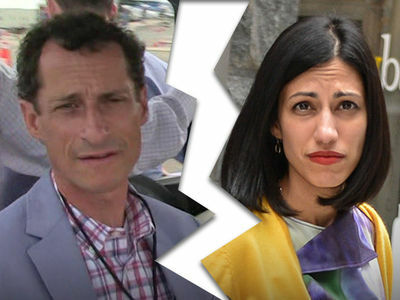 As you know, Weiner is married to now-estranged wife Huma Abedin, the longtime chief deputy for Hillary Clinton. The warrant notes authorities believe there were "thousands of emails," including many related to Clinton in Weiner's computer. The warrant notes there's probable cause to believe some of the Clinton data was classified and his laptop wasn't authorized to have national defense information. It's interesting the warrant specifically targets the Clinton emails, which triggered a second investigation by the FBI during the initial investigation.